Give a friend a log of goat cheese and they have a nice appetizer. Give them a share of Belle Cheve from Kickstater and they have a share in Belle Cheve. Belle Cheve is a fromagerie in Elkmont, Alabama. The original owner wanted a nice French goat cheese and got herself some goats and the rest is history. Well, actually, the story takes its modern turn away from Alabama. It seems that Tasia Malakasis stumbled across some Belle Cheve in New York City where she found herself transplanted from Alabama. She was so impressed with cheese that she decided she wanted to return to Alabama and make cheese. This is the point in the story that everyone has from time to time. That, "Hey, I'm going to quite my job and start a food company on a farm a thousand miles from where I am now and all will be fine" moment that most people have and quickly forget about. Malakasis refused to forget. She called Belle Cheve. She begged to work there. She begged to learn how to make cheese. She showed up. She offered to buy the place. Her dogged endurance paid off and soon, she was making an extraordinary goat cheese sought out by chefs and consumers far and wide. 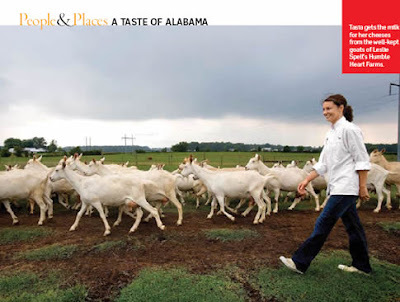 The story hits a bit of a bump in the road, however, because the lease on the land where all those lovely Alabama goats roam free is up and the landowner will not renew the lease. Belle Cheve needs its own place. That is where Kickstarter comes in. Kickstarter is a way to garner funding from people out there in the real world. So be one of those people. If you are one of the 1% out there and need a tax right off... send Belle Cheve $100,000 and get cheese for life. If you are one of the 99%, give goat cheese as a gift... not just the cheese but a chance to keep this great dairy alive and milking.